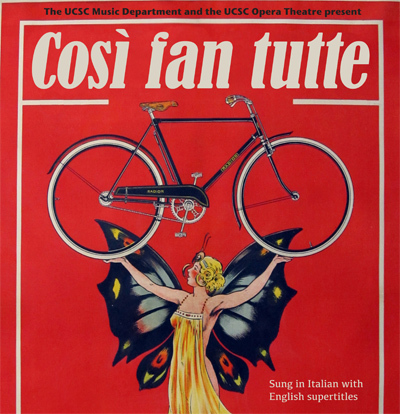 UCSC's award-winning Opera Program presents one of opera's best in a fully staged production featuring the UCSC Orchestra. Sung in Italian with English supertitles. Guglielmo and Fernando are two army officers who are madly in love with two sisters, Fiordiligi and Dorabella, and they are firmly convinced that their passion is reciprocated by the ladies in question. Their acquaintance Don Alfonso, an older, wordly-wise man, questions their confidence and lays a bet that the girlfriends would turn their affections elsewhere given half a chance, not because of who they are but merely because they are women. The men agree to allow Don Alfonso two days to prove his point, if he can. Doors open 30 minutes before curtain. UCSC Ticket Office (831-459-2159) or SC Civic Auditorium box office (831-420-5260).